On Saturday morning, 13 August 2005, we enjoyed the hotel's complimentary breakfast. Olivia, the twelfth member of our tour group, arrived on a flight early that morning. A student at Harvard, she is Jim & Susan's oldest daughter. 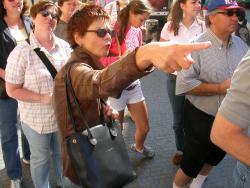 At 9:20 we began a walking tour with a Czech-born special guide, Marcella. 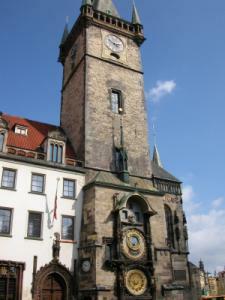 We visited the Old Town Square where we saw the Astronomical Clock at the old town hall. This amazing clock is kept in good repair and the face and its measurements of time are unlike any clock anywhere else in the world. The clock has some interesting actions on the hour, but we were never there at the proper time to witness it, not to mention the huge crowds that gather in front of the clock before every hour. We walked through part of what was once the Jewish Ghetto (or Quarter). Of the 1.2 million people in Prague today, only a few thousand are Jews. The area known as the Jewish Ghetto was once the only place Jews could live, but before 1900 this part of Prague was becoming modernized. Apparently, most Jews remaining in Prague were exterminated by Hitler at the beginning of World War II. We walked past a couple of synagogues and got a glimpse into the Old Jewish Cemetery, where there are 12,000 tombstones over about 100,000 buried bodies. The last person buried there died in 1787. We walked past the Carolinum University, the first university of central Europe. 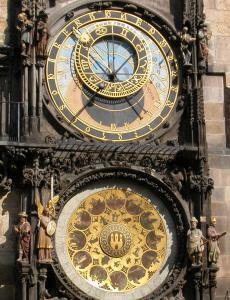 It was founded in 1348 by the Holy Roman Emporer, King Charles IV, during the golden age of Prague. We visited the Charles Bridge, the most recognizable Prague landmark. Its construction was begun in 1357 during the reign of King Charles IV. Now open only for pedestrians, it crosses the Vltava River to join Old Town with Little Quarter. In the early afternoon the guided tour was concluded. 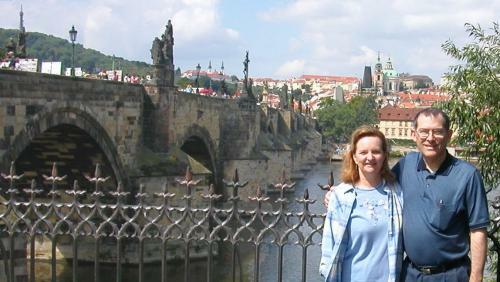 Michael and Jeannie found a Czech restaurant and enjoyed an authentic Czech lunch. We spent the rest of the afternoon shopping after getting lost searching for an interesting store we had passed during the morning walking tour. We did eventually find it and spent lots of money there. We also viewed the inside of "the Church of Our Lady before Týn." 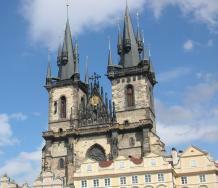 The gothic towers of this cathedral dominate the Old Town Square in a surreal fashion. 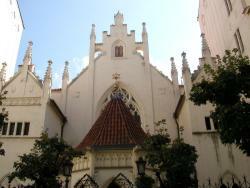 The construction began in 1365. It became associated with the Bohemian reform movement. Before 1620 it was the principle Hussite church in Prague. For supper we ate outdoors on Old Town Square at a small Italian restaurant. After the meal we learned they would not accept a credit card, only Czech currency. We had already spent nearly all of the 2,000 Kc (koruna or crowns) we got our first afternoon from an ATM near the hotel. (We got 23 crowns per 1 U.S. dollar from the ATM.) Jeannie waited at the table till Michael found an exchange, which provided only 19 crowns per U.S. dollar. (He couldn't locate an ATM.) 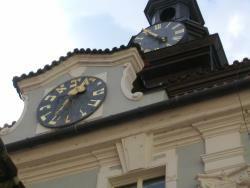 The Czech Republic has joined the European Union, but has not yet switched to euros. After paying the bill, we retured to our hotel and dressed for the opera. At 7:20 our tour group was taken by bus to Divadlo Na Vinohradech, an opera house where we enjoyed Verdi's "La Traviata" in Italian. The day before departing the States, we learned what opera we were to attend. We read all we could about it, making it much more enjoyable to hear and watch. Other people on this tour knew little or nothing in advance. This is the opera that Julia Roberts was taken to on her first date with Richard Gere in the movie "Pretty Woman." The story is about Violetta, a courtesan in 18th century Paris who died of tuberculosis while in her early twenties after discovering "true love" with Alfredo. After returning to the hotel about 10:30, Michael and Jeannie tried gelati at a nearby pizzeria. It wasn't very good. We then got a Coke Light (Europe's version of Diet Coke) at McDonald's and returned to our stuffy, but otherwise very nice, room.